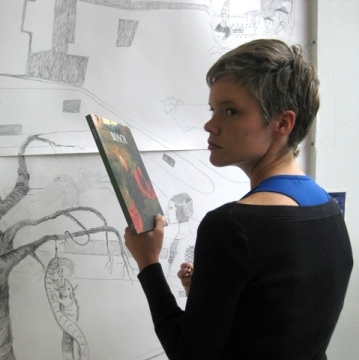 Marisa Rappart (Emmen, The Netherlands, 1979) is specialized in drawing. She finished the art academy in Kampen, followed by a program at the Post St. Joost in Breda, which she completed in 2004. Since then her drawings are on show at home and abroad. Apart from her studio work she teaches art to amateurs and semi-professionals. She lives and works in Utrecht, The Netherlands. I am first of all a drawer. If I use other media, the work will still flow from the drawing. In an animation for instance I let a drawing move and if I make an installation, this is because I want people to be able to walk through the drawing. I love to draw as it is so direct. In a drawing one can see all successive steps of the maker. If you put a line on paper, there is no way back. You cannot get rid of it; you have to do something with it. 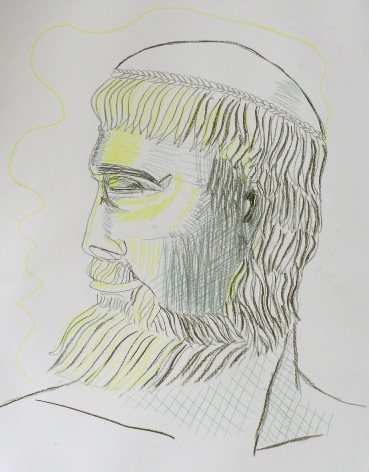 In this way you can read back the whole creative proces in my drawing. I consider my drawing hand as a kind of seismograph of my inner self: a light, soft line tells another tale than a hard scratched pencil line. I love stories. It intrigues me how fact and fiction can rub each other in a story. 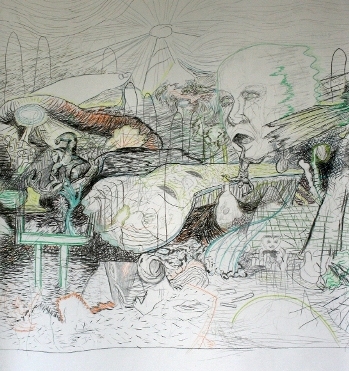 In my drawings I tell stories about the world surrounding us. These stories may be about death, guilt, shame or salvation. These big themes I present with witticism; in one of my drawings you can for instance see Death fall off a cliff while roaring with laughter. I cloak my stories in a pencil line, a strange figure, a mythic creature. I collect fragments from the sea of information around me: pictures from the newspaper, images I encounter on the internet. I also look a lot at the history of art and at folk art. From this stream of information I select snippets that I combine in my drawings in a collage type of way. This produces strange, alarming and ambiguous scenes. This comes together rather intuitively; often I am surprised myself about the figures and landscapes that emerge from the paper. In my work I hope to let the viewers wander through an imaginary world, which prompts them to reflect about reality and their position in it. 1. Without title (the journey). 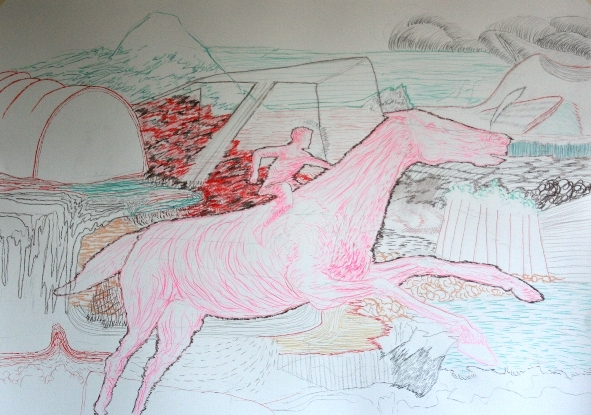 A boy traverses a semi-abstract landscape on a big pink horse. Although he is present in the environment, he seems to be separated from it at the same time by the heavy contours around him, as if the landscape is nothing but a projection, a dream. Pencil and chalk on paper, 70 x 100 cm. 2. Mountain. A friendly mountain with holes and caves to hide and get lost in. Pencil on coloured paper, 21 x 32 cm. 3. Desolation Island. On this island all kinds of storylines can be discovered. A dinosaur and a monkey attack each other ferociously. A giant head looks at it with bewilderment, tears rolling down his cheeks. From his mouth a human being drops down. 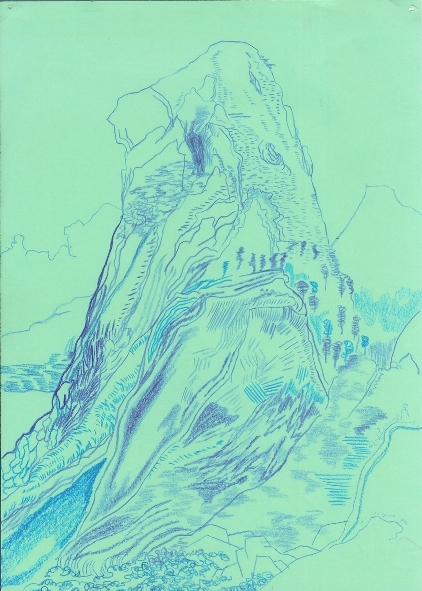 The scene is set in a mysterious landscape, consisting of a great variety of pencil lines. Pencil, charcoal and chalk on paper, 110 x 100 cm. 4. Without title. 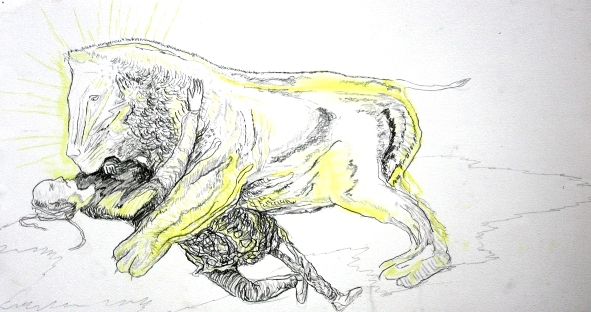 The fight between a man and a lion is partly a loving embrace, partly a life-and-death struggle. Pencil on paper, 30 x 55 cm. 5. Sailor. Man who sails the seas. Pencil on paper, 65 x 50 cm.